le chaudron de vulcain – March 30 , 2017. EN. Cerro Azul , Nevado Del Ruiz , Kilauea , Planchon Peteroa . March 30 , 2017. EN. Cerro Azul , Nevado Del Ruiz , Kilauea , Planchon Peteroa . Home / blog georges Vitton / March 30 , 2017. EN. Cerro Azul , Nevado Del Ruiz , Kilauea , Planchon Peteroa . Update of the Cerro Azul volcano activity. Seismic and deformation data indicate that a magmatic body is attempting to rise to the surface. An eruption in the days or weeks to come, probably of the same type as the preceding eruptions, for example, with emission of lava flows, would be possible. Seismic activity increased in February in the Sierra Negra volcano area. 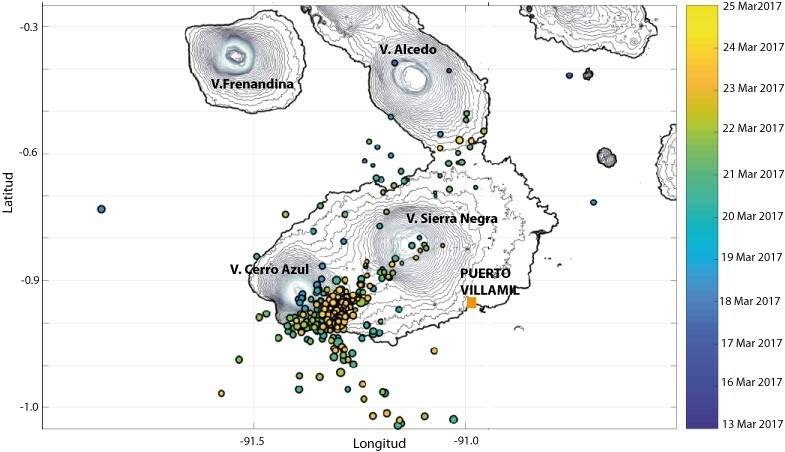 However, between 18 and 19 March, seismicity increased further and migrated south to concentrate in the southeast of the Cerro Azul volcano (Figure 1). This clearly resulted in an increase in the number of recorded earthquakes (Figure 2) and the values of the seismic energy released (Figure 3). Figure 1. Location of earthquakes between 13 and 25 March. The events that characterize this seismicity are of the fracture type, called volcano – tectonics (VT). As reported in Special Report 1 of March 20, a swarm of earthquakes of about an hour was recorded. Eventually, the activity became more sporadic. However, on the 21st, between 7:15 pm and 10:00 pm, a new swarm was recorded as shown in Figure 3. Most events had magnitudes between 2.4 and 3 degrees and the earthquake of magnitude was M3 , 6. After the swarm of March 21, seismicity continued, but the events are more dispersed. Figure 2. Number of earthquakes per day, noting the increase recorded between 20 and 21 this month. Figure 3. The energy released in the Cerro Azul volcano area since 16 March. 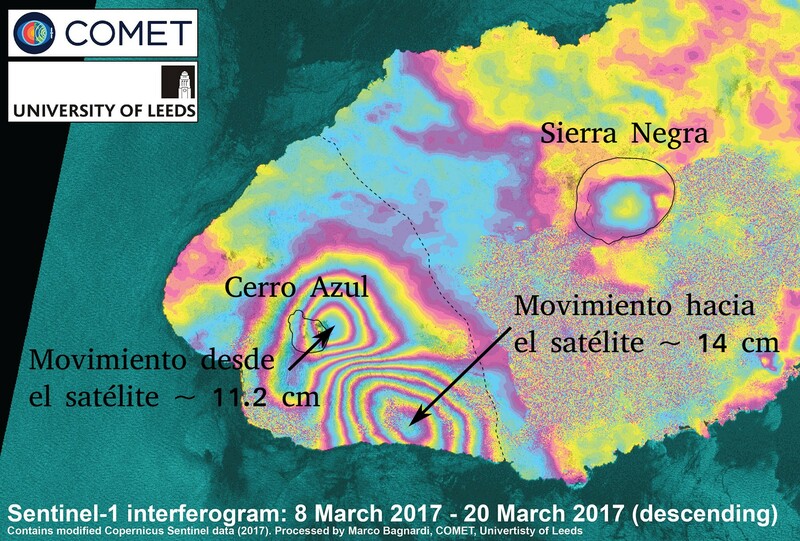 According to the results of the radar data processing of the Sentinel-1 satellite by Marco Bagnardi of the University of Leeds, a clear distortion of the Cerro Azul volcano between 8 and 20 March (Figure 4) is observed. This deformation is characterized by inflation of the volcano, approximately 14 cm to the southeast and the associated deflation of the edge of the apex about 11.2 cm. These data are reproduced relatively well in the numerical model (Figure 5), corresponding to a volume of 20 to 40 million cubic meters of magma, which left the reservoir 5.5 / 7 km below the summit and the feeding of a Sill-like intrusion (concordant plane structure) located between 3.5 and 6.3 km deep under the south-east flank. The location of the intrusion corresponds to the location of the earthquakes that support this interpretation. Figure 4. 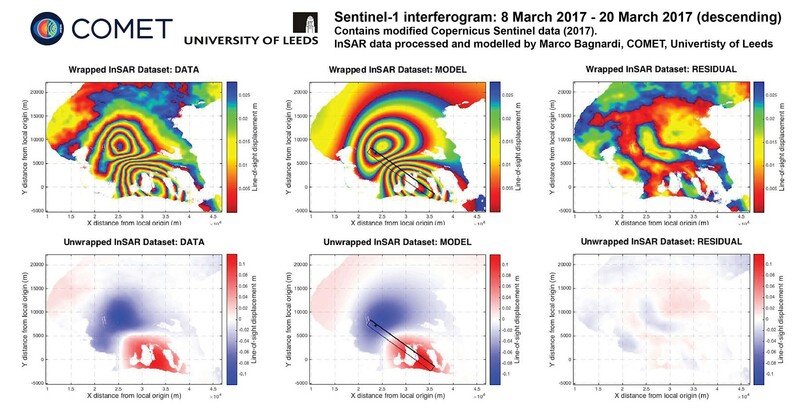 Radar interferogram between 8 and 20/03/2017 (modified by Marco Bagnardi, Comet, University of Leeds). Figure 5. Numerical model proposed by an intrusion of a sill in the southeast flank of the Cerro Azul volcano (Marco Bagnardi, Comet, University of Leeds). – Decline in activity observed without magma reaching the surface. The level of activity continues: at the level of yellow activity or (III): changes in the behavior of the volcanic activity. 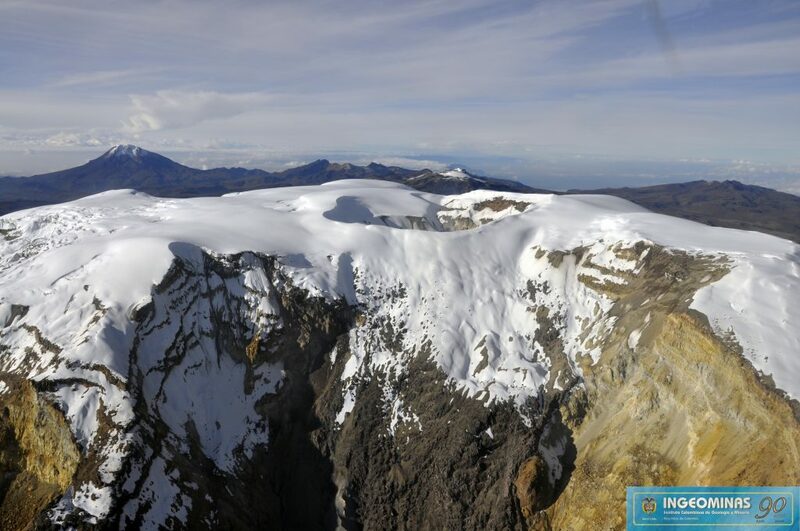 Over the past week, the various monitoring parameters show that the Nevado del Ruiz volcano continues to show unstable behavior. Some changes are highlighted, including seismic activity related to fluid dynamics in volcanic structure conduits, especially observed over the last three days. The seismicity associated with fracturing of rocks under the volcanic structure showed similar levels to the previous week. This seismicity was located in the distal zones of the North, North-East, South-East, South-West and in the Arenas crater. The depths of the earthquakes ranged from 0.7 to 8.7 km. The maximum magnitude recorded during the week was 0.9 ML (local magnitude) for the earthquake on March 22 at 14:09 local time, located 4.8 km south-southwest of the Arenas crater, At 3.5 km depth. 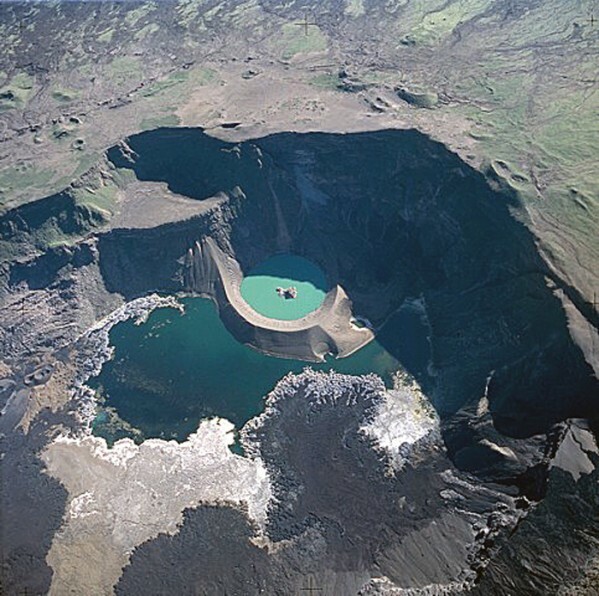 Concerning the seismic activity associated with the fluid dynamics in the volcanic structure ducts, it showed an increase in energy levels and higher recurrence of the recording of these signals. This type of activity is mainly characterized by the appearance of multiple earthquakes of fluid and pulses of tremors, both with varying energy levels and durations. Continuous episodes of tremors, low energy and short duration, which occurred in the continuity of some of the above events are also recorded. The earthquakes were mainly found in the Arenas crater. 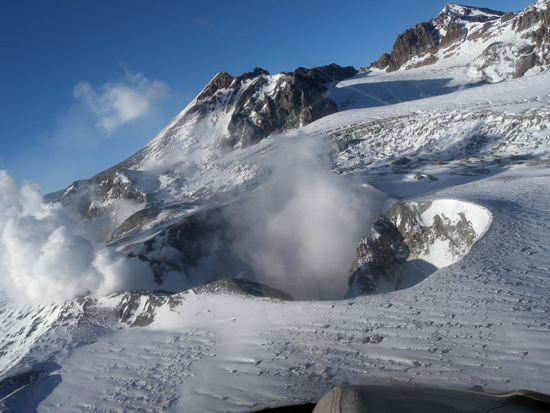 Some of these seismic signals have been associated with emissions of gases and ash into the atmosphere, as confirmed by the cameras installed in the volcano region and reports from Los Nevados National Park officials and the Colombian Geological Survey Who were in the field work. Recording seismic signals of this type, with higher energy levels, which may be associated with emissions of gases and ash are not excluded. It is important to remember that ash emission processes can occur over several days and sometimes several times during the day, without involving an individual report for each episode. Yesterday, between 11:30 and 12:00 (local time), a seismicity episode of Drumbeat type was recorded. This event, unlike those recorded and reported so far (consisting of volcano-tectonic earthquakes), has been characterized by periodic and continuous hybrid-type recording, with low energy levels at intervals of time of about 10 s. It is important to note that this episode is the longest recorded on the volcano Nevado del Ruiz. Volcanic deformation, measured from electronic inclinometers, Global Navigation Satellite Systems (GNSS) and satellite images to determine changes in tilt, position and shape of the volcano, continues to record In recent months, a deflationary process and intermittent inflation / deflation impulses, possibly linked to gas and ash emissions. The volcano continues to emit significant amounts of water vapor and gases, including sulfur dioxide (SO2), as shown by the values ​​obtained by the SCANDOAS stations installed in the volcano zone and the analyzes Satellite image. In the tracking information provided by the Mirova and NASA FIRMS portal, a thermal anomaly was identified on 23 March. 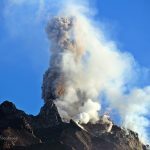 The columns of gas, steam and ash from time to time reached a maximum height of 2000 m measured on the top of the volcano on 24 March. 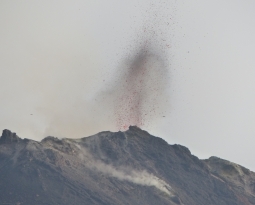 The direction of dispersal of the column was in line with the direction of the wind in the area, which predominated during the week to the northwest of the volcano. 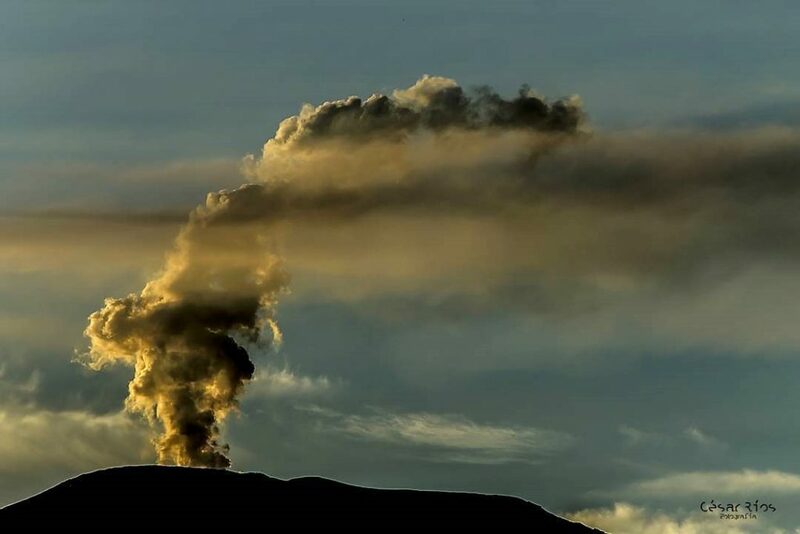 The volcano Nevado del Ruiz continues to activity level Amarillo. 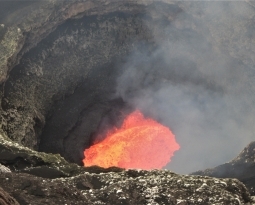 Coast Guard Establishes “Safety Zone” Around Lava Ocean Entry . 29 MARCH 2017. 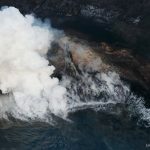 The Coast Guard announced today it is establishing a “temporary safety zone” for the navigable waters surrounding Kilauea Volcano’s active lava ocean entry at Kamokuna. The USCG says the temporary safety zone will encompass all waters extending 300 meters, or 984 feet, in all directions around the entry of the lava flow into the ocean from noon March 28 to 8 a.m. Sept. 28. 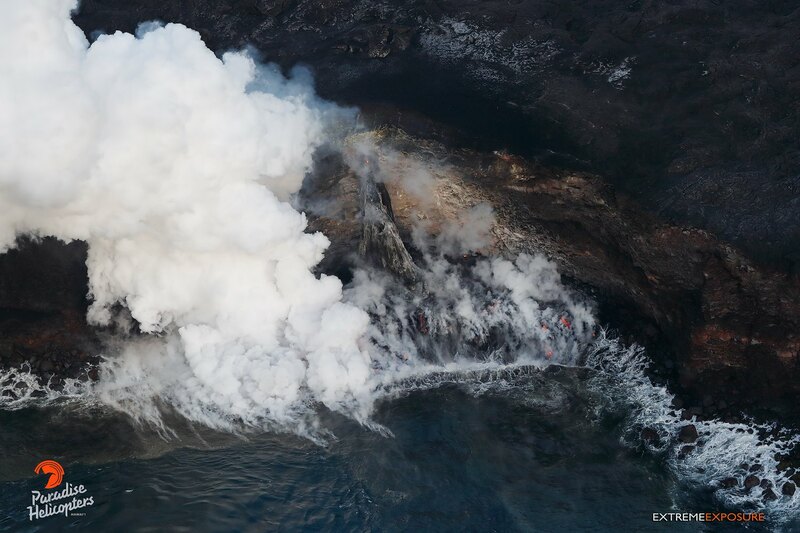 The spectacle of lava flowing into the Pacific Ocean has spawned a small but growing industry of lava boat tours. The last big collapse occurred on New Years Eve, when over twenty acres of a newly-formed lava delta vanished into the sea. The moment gave birth to a fascinating lava “firehose” that lasted a few months. A new delta is now forming at the lava ocean entry. Thursday, March 23, 6:30 am – Pu‘u ‘O‘o & Kalapana overflight: The firehose no longer exists, instead the molten stream has crusted over and created an arch that transports the lava down to the newly formed delta of land. Multiple fingers of lava flow over the newest black sand beach on the planet, to enter the Pacific Ocean. The USCG says a Broadcast Notice to Mariners has been issued via VHF-FM marine channel 16 about the safety zone. Entry of vessels or people into this zone is prohibited unless specifically authorized by the Coast Guard Captain of the Port Honolulu or his designated representative. Area Maule. 28 March 2017 22:48 pm (local time). On March 28, 2017 at 22:48 local time (01:48 GMT), the monitoring stations installed near Planchon Peteroa recorded one (1) earthquake associated with fracturing of volcanic tectonic rocks. 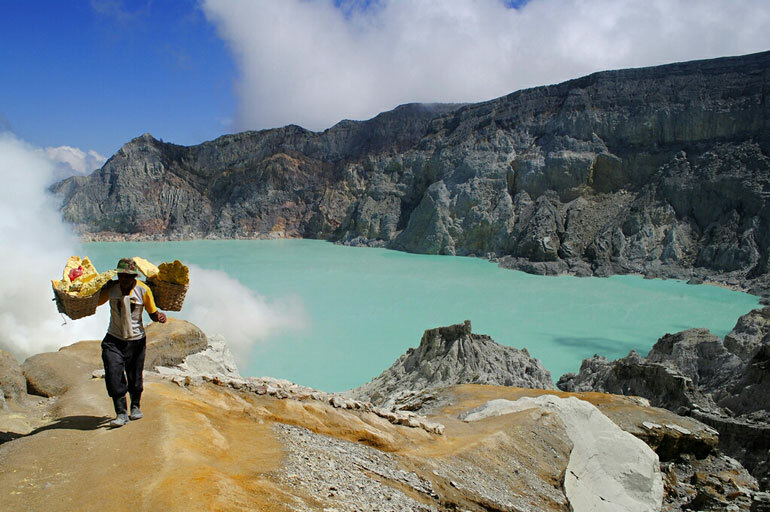 The event was located 2.82 km north (N) of the main crater. At the time of this report, an earlier event of lower magnitude (M 1.8) was recorded. There is no report from the authorities or surrounding communities on the perception of these events. The level of volcanic alert remains at the AMARILLO level. 30/03/2017. FR. Cerro Azul , Nevado Del Ruiz , Kilauea , Planchon Peteroa . 31/03/2017. FR. 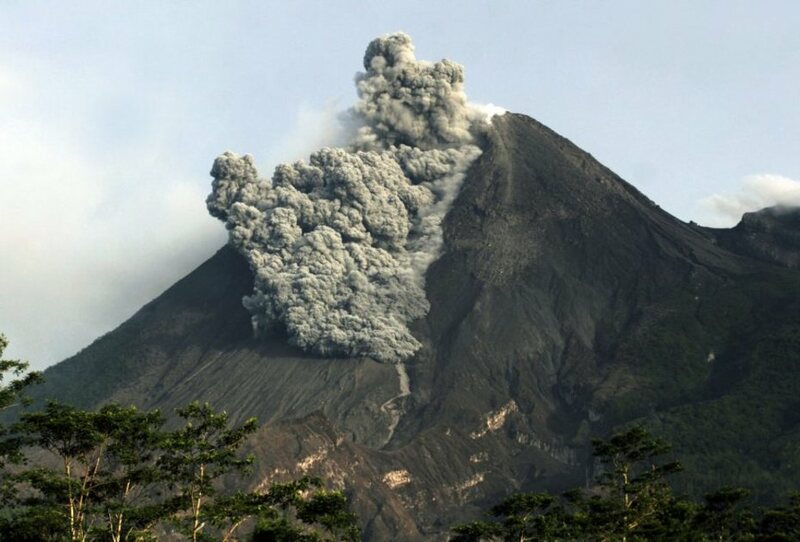 Fuego , Ebeko , Turrialba , Sinabung .